With a solar eclipse crossing the North American continent on August 21st, lots of us will be spending time staring at the sun. Don't get caught short in a last minute rush of eager eclipse watchers. Choose how you will safely view the sun and get the devices or supplies you need now. We all occasionally glace directly at the sun without any immediate damage beyond that black spot that fades after a half hour or so. Assuming that a nice dark pair of sunglasses will be all you need for viewing the eclipse is risking blindness. The eclipse is interesting and it is natural to look for much longer than the brief glances we get in daily life. Sunlight also has substantial amounts of invisible infrared and ultraviolet lite that can blind us invisibly. I've written before about sun safe white light filters for telescopes. Today's note conentrates on viewing with just your eyes or binoculars. Filters for binoculars are similar to those for telescopes, except that you need two of them. You can get them commercially from the same sources as telescope filters, or make your own using plastic solar filter sheets. Welders glass #12 and higher are safe for looking at the sun; easy to find and inexpensive. I cover the edges of the glass with plastic tape to protect from cuts. Many welding goggles are sold with #5 glass, these are NOT safe for looking at the sun. Make sure that they are at least #12 glass or a solar film specifically certified as safe for visual observation of the sun. Sun safe solar filters should be certified to comply with either the CE British Standards Institute #0086 Notified Body HP2 4SQ or ISO 12312-2:2015 standards. Sun safe solar filter film is available as inexpensive cardboard eyeglasses and rectangular cards. I find that the cardboard glasses get uncomfortable quickly and are hard to share. The rectangular cards are easy to share with friends with or without glasses. All of these options are available for less than a couple of dollars. More comfortable sunglasses style options are available, but for about the same price you can get solar safe binoculars that offer a magnified view. 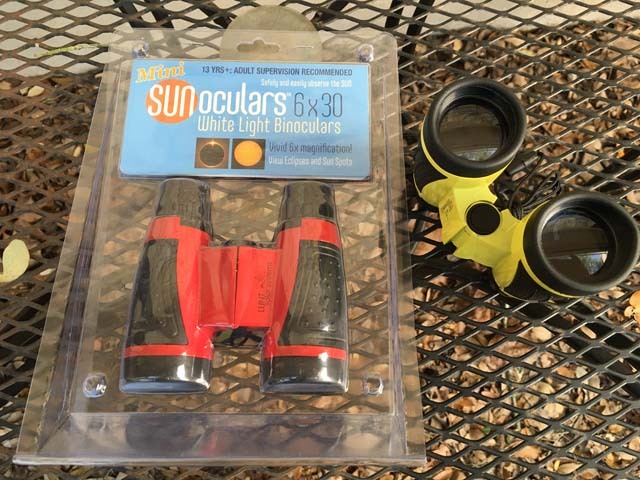 Safe solar filters can be added to binoculars for a close up view. Dedicated solar viewing binoculars are also made. These have the safety advantage of permanently mounted filters. Lunt Mini Sunoculars are about the same price as comfortable sunglasses style eye protection safe for direct solar viewing. They will show you a lot more detail. They are 6X30mm with 9mm of eye relief and adjust for an eye spacing of 56-71mm. The solar filter is built in and gives a nice yellow-orange sun. One of my eyes is very near sighted and the eyepiece focus adjustment was enough to accommodate it. With eyeglasses on there was enough eye relief for a good view. With the built in solar filer, everything other than the sun is black, so it took a moment to get it in the field of view. The FOV is about 3 degrees. The image appeared sharp and the advertised 6x larger. There were only small sunspots are on the sun today and I wasn't able to pick them out with these. I'm confident that mid to large size sunspots will show up well. They are very light and easy to hold steady. 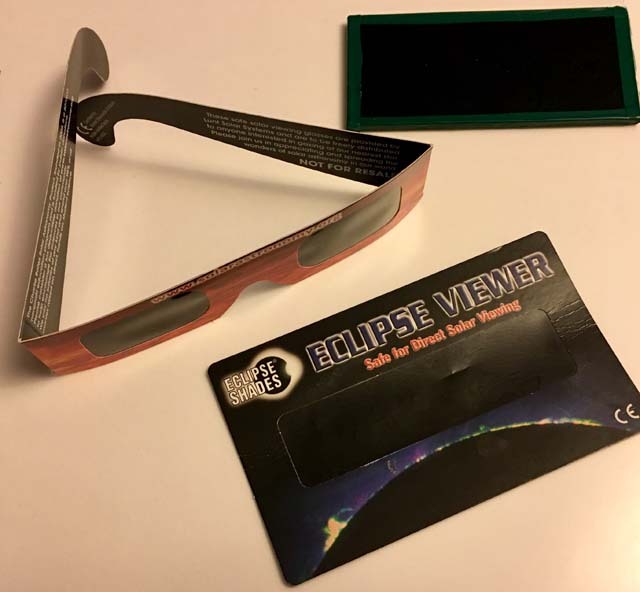 I think that these will be great to have at at the eclipse and for viewing mid to large sunspots. They won't do you any good during totality, but regular binoculars or just your eyes are what you want then. They were less than $30 and I've seen them at B&H Photo, Amazon, and the ASP solar eclipse shop. For safe visual observation these need to reduce the sun's intensity by 1/100,000. These may be marked optical density ND 5.0, ND100000, or ND 116. To protect a camera sensor from damage ND 3.8 (ND6310 or ND113) is suggested, but this should only be used when focusing with an electronic screen. DSLR through the lens focusing will exposure your eyes to unsafe levels of sunlight. 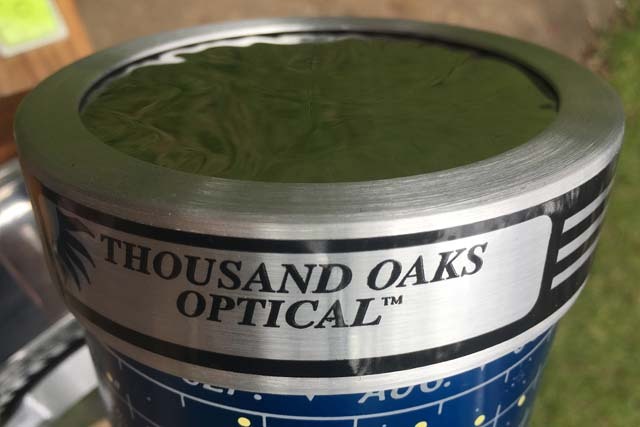 Neutral density filters not specifically marked as safe for visual solar observation, may not block invisible UV or IR light to levels safe for your eyes. Solar filters must always be used where light enters your instrument (top or front) and not at the eyepiece end where solar energy is concentrated. Any eyepiece filter or projection device (screens and sun funnels) risks damage to your eyes or telescope. The filter material is mounted in a cell. Filter cells can be made of almost any material: metal, plastic, and cardboard are common. Filter cells either slip over the top or screw (often for cameras) onto the instrument. Slip on filters with solar safety film are easy do-it-yourself projects. Most telescope makers and astronomical shops will stock them. If the filter is not specifically made for your instrument, you will need to supply the outside diameter of the tube where it will be fitted. I've had good experiences with two well known makes of solar filters: Baader Planetarium AstroSolar Safety Film and Thousand Oaks Optical. The American Astronomical Society has a list of reputable vendors of solar filters & viewers.